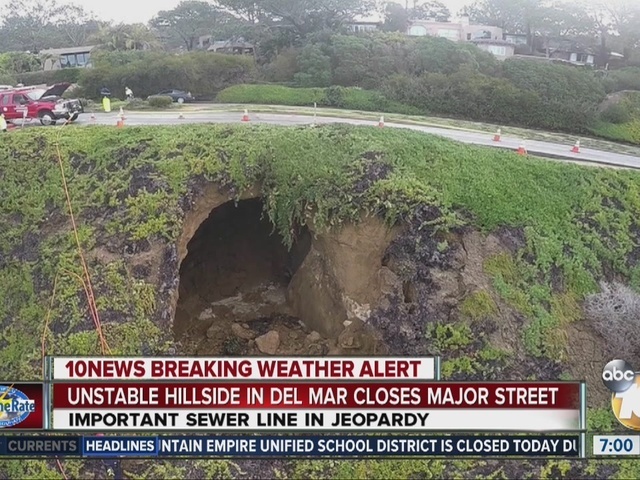 SAN DIEGO - A series of blustery El Niño-driven storms that have saturated the San Diego area continued early today but began to diminish in intensity, leaving the region with flooded roadways, downed trees and snow-capped eastern peaks. The spate of frigid, wet and windy conditions, which began late Sunday, was expected to continue fading through late Friday, with the showers becoming steadily weaker and more scattered, according to the National Weather Service. PHOTO GALLERIES: El Niño proves its might | Let it snow! The drenching sustained by the county during the stormy spell has been significant. 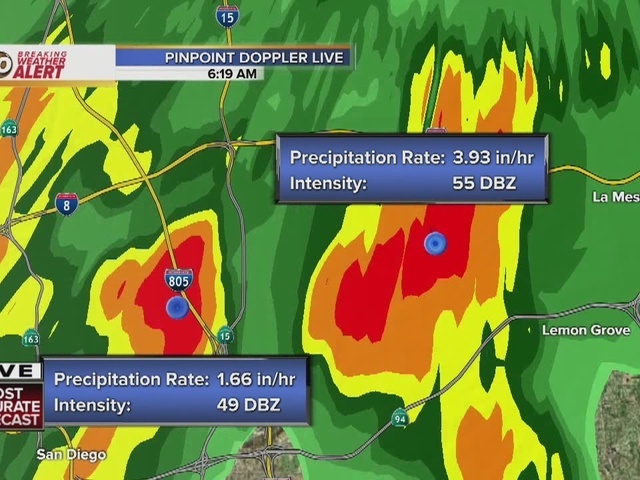 Over a 72-hour period ending at 9 a.m., the unsettled atmospheric systems shed 6.63 inches of rain on Mount Woodson, 5.82 in northern Poway, 5.5 in Pine Hills, 5.38 at Henshaw Dam, 5.27 in Julian and 5.05 at Miramar Lake. 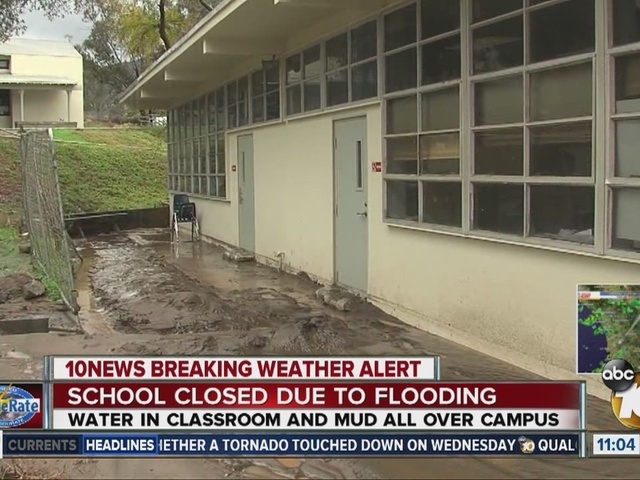 Other three-day precipitation tallies include 4.94 in the Palomar area, 4.93 at Lake Cuyamaca, 4.9 at Ramona Airport, 4.76 in Kearny Mesa, 4.19 in Barona, 4.16 in Descanso, 4.12 in Harbison Canyon, 4.05 in Flinn Springs, 4.02 in Santee, 3.9 in Santa Ysabel, 3.82 in Rancho Bernardo, 3.75 in Scripps Ranch, 3.63 in Alpine, 3.41 in Granite Hills, 3.22 in Linda Vista, 3.21 in Rincon Springs, 3.18 in Mission Valley, 3.17 in Lakeside, 3.15 in Santee, 3.11 in La Mesa, 3.07 in Escondido, 2.91 in El Cajon, 2.79 in Oceanside, 2.76 at Lindbergh Field, 2.64 in Warner Springs, 2.63 in Encinitas, 2.4 in Vista, 2.38 in Carlsbad, 2.09 in Fallbrook, 2.07 in Borrego Springs, 1.88 in Point Loma and 0.3 in Solana Beach. The storms also brought widely varying amounts of snowfall to the East County highlands, including 12 to 15 inches on Mount Laguna, about seven inches on Palomar Mountain, an inch or so in Pine Valley and a light dusting in Descanso, according to meteorologists. The precipitation was on track to peter out by early Saturday, though another low-pressure system likely will bring more showers later in the weekend, the weather service advised.